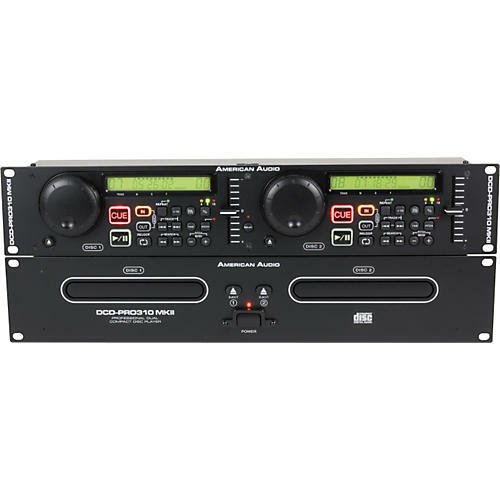 The American Audio DCD-Pro 310 MKII Dual CD Player is a budget-friendly audio CD/CD-R compatible system for DJs who want fast-and-easy set up. The DCD-Pro player offers single and continuous playback, with a +10 track skipping button and 4 speed search for quicker access to songs on your MP3-loaded discs. The 310 MKII'a bright LCD display has 3 time viewing modes and tells you what playback mode you're currently using. Other features include Auto Cue, Single Repeat mode, three pitch control options, pitch bend, and pitch/frame search jog modes. The DCD-Pro 310 MKII CD player also has 60-second transport and mechanical anti-skip protection, as well as flip flop for relay playback.